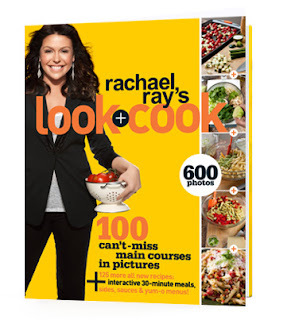 You can get all the details of the book signing tour for Rachael Ray's new cookbook, Look and Cook , over at Book Signing Central. You are lucky if you live in any of these spots! Hopefully more dates will be announced soon. If they are, I will update this post. 11/5/10 Noon at Borders Books – Post Road. Fairfield, CT.
11/6/10 1:00 PM at Borders Books – Commons Way. Bridgewater, NJ. 11/15/10 6:00 PM at Barnes & Noble – Union Square. New York, NY. 12/15/10 7:00 PM at Borders Books – Preston Road. Dallas, TX. 12/17/10 7:00 PM at Barnes & Noble – Peachtree Road NE. Atlanta, GA.
Will Rachael be coming to Louisiana for the singing? It would be the absolute best Christmas gift ever if she does! She has tons of fans here! I hope she does, she would love New Orleans and the southern cuisine here! It would be great inspirations for some new recipes! Please come to Ohio, no one exciting ever comes here and that would be great! Even if you were to come to pennsylvania like the Barnes and noble in Erie!